The increasing number mining pool support for BIP91 and SegWit has pushed bitcoin price upwards as a split seems to have been avoided. So it looks like disaster averted, or at the very least postponed. We’ve had what seemed like an eternity of discussion, with no sign of a consensus looming. But now it looks like the battle for Bitcoin’s (immediate) future, has been won within hours of the first shots being taken. I guess there’s nothing like the risk of losing a shed-load of money to really focus the decision-making part of the mind. After successful mining of the first BIP91 blocks by BiXin and Antpool, an increasing number of the larger mining pools are signaling adoption of the new protocol. @slush_pool will start signalling #BIP91 tomorrow. Please calm down everybody, we don't play any political game. At the time of publishing, XBT.eu was showing 80.5% of the last 144 blocks mined were BIP91 protocol. This represents a nearly eight-fold increase of the same statistic at the time of our previous article, and is above the 80% threshold needed for lock-in. It is interesting to note that this has also swallowed a healthy chunk (comprising almost 60%) of blocks, which were being mined by those who had already upgraded to SegWit. 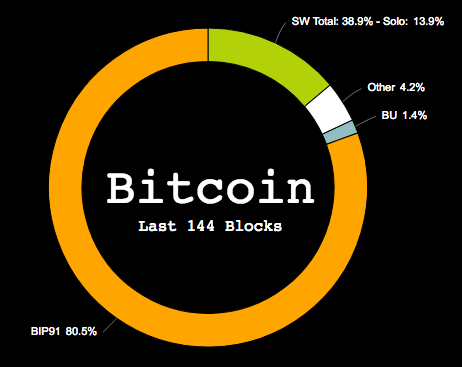 This figure doesn’t yet include blocks mined by Slush Pool, who have signaled for BIP91 but not yet implemented. 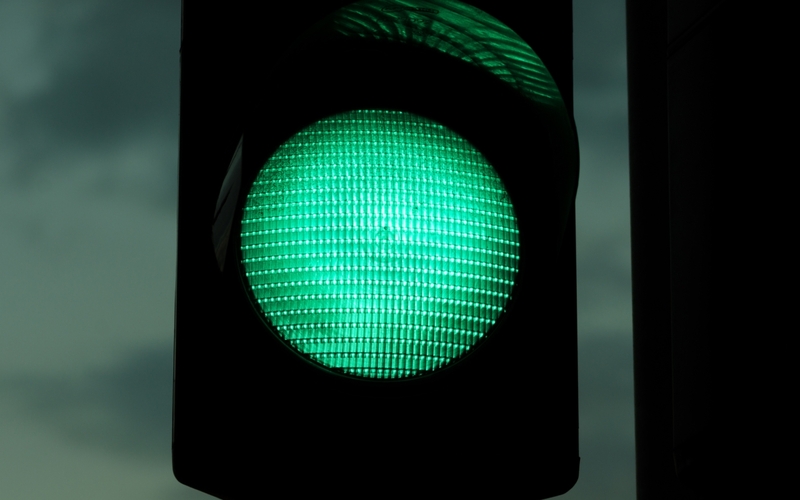 In fact, the hash-power represented by the total of all miners and pools who have signaled for BIP91 is already safely at a level which should see the Bitcoin network avoid a split. At time of publishing the only major players not to signal are F2Pool and BitFury, though the latter has confirmed it will signal shortly. There are still over 200 blocks needed for lock-in, so if the hashrate support remains above 80%, we should have a definitive outcome within the next few days. Confidence in Bitcoin seems to have returned, with a reversal of the downward trend of the last few days. The price is currently nearing the $2400 mark, and looking to maintain that upward trend. This reflects a healthy amount for sustained and sustainable growth, and is around where a six month price chart would extrapolate to. Assuming we ignore the tumultuous rollercoaster of the past two months. For the time being, probably yes. It’s likely we will see another price hike when (and at this stage I stubbornly refuse to use if) BIP91 gets officially locked in. Other than that we should be back to normal. Which, of course, means anything could happen! Will Bitcoin avoid a hardfork and lock in SegWit? Share your predictions below!